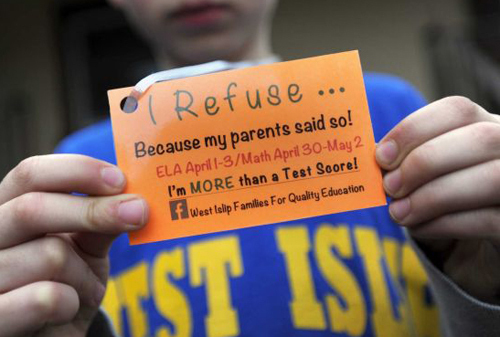 Back-to-School: No Staples, No Walmart, No Testing! It’s that time of year where teachers are busy preparing for their return to work. Here in Comsewogue we return to school two weeks from today with the PJSTA Union Conference in the morning followed by a Superintendent’s Conference Day in the afternoon. I stopped up at school today and was happy to see a few of my fellow PJSTA brothers and sisters (actually I only ran into PJSTA sisters today!). Some of them people I have worked with for many years, one of them a brand new PJSTA member. Seeing them reminded me that one of the things I enjoy so much about my job is the bonds that we form with the people we work with. In support of our brothers and sisters in the American Postal Workers Union we are asking every PJSTA member to boycott Staples when buying your back to school supplies. Just as privatizers are seeking to destroy public education, they are doing the same with the postal service. We are labor and we stand with our brothers and sisters in the APWU! Between 2005 and 2010, the Walton Family Foundation gave nearly $700 million to education reform organizations. Specifically, the family provides lavish funding for voucher programs, charter schools, and policy and advocacy groups devoted to establishing and promoting alternatives to public schooling. Voucher programs, charter schools, and “alternatives to public schools” generally mean that someone is looking to profit off the education industry at the expense of public school teachers, students, and the communities that they serve. When you wonder why your profession is a shell of what it was ten years ago, WalMart is as good of a reason as any other. So if WalMart comes to your faculty meeting this year looking to hand out gift cards, tell them you don’t support businesses that try to hurt you. Finally, if you are a parent, no back-to-school list is complete without an opt out letter! Danielle Boudet, Jeanette Deuterman, and Chris Cerrone collaborated to tell you everything you could possibly want to know about opting your children out of the abusive state testing agenda. This entry was posted in General and tagged APWU, Back-to-School, Opt Out, Staples, walmart. Bookmark the permalink.